Last month we shared with you a fantastic Wall Clock (EasyRead Time Teacher Wall Clock) that is, in our opinion, a brilliant tool for teaching children how to tell the time. If you’ve not yet read our review of the The EasyRead Time Teacher Wall Clock then read it here. The wall clock main difference from other clocks is that it comprises of two different coloured halves. One half has all the minutes past the hour (up to 30) printed on it. And the other half has all the minutes to the hour printed on it. This means children can use the same process for telling the time when reading the minutes to the hour as they do when reading minutes past the hour. “Step 1: Read the number at the end of the long hand. Step 2: Say “minutes to” if it’s pointing to the red side of the watch, or say “minutes past” if it’s pointing to the blue side. Although the clock is a fantastic resource, how do you support the same learning process when out and about when you are without the wall clock’s handy features? Well thankfully they’ve thought of this- with their brilliant range of EasyRead Time Teacher Watches. 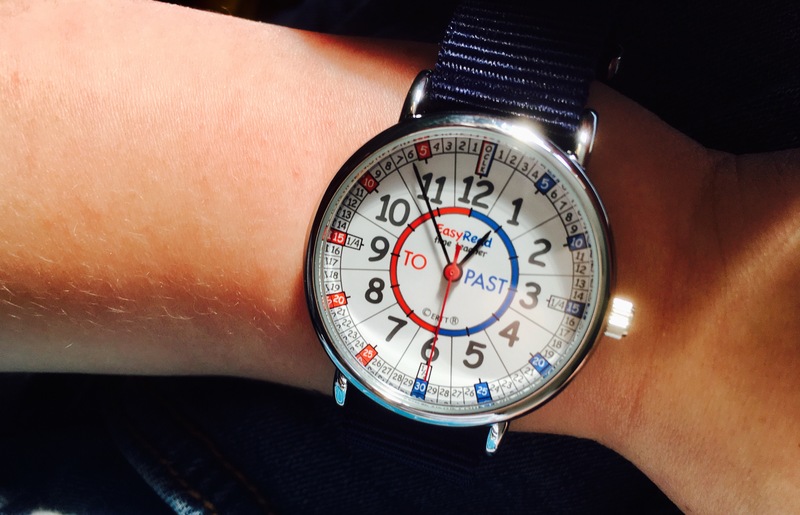 Continuity of Learning Style- We loved that this watch enables you to teach your child how to tell the time in the same 3 Step Teaching System as the Wall Clock, wherever you are. Continuity when learning something new can be extremely important and can help children learn the skill quicker and easier. The watch has the same brilliant features as the clock including all the minutes being displayed as well as the fractions for quarter past, to and half past. 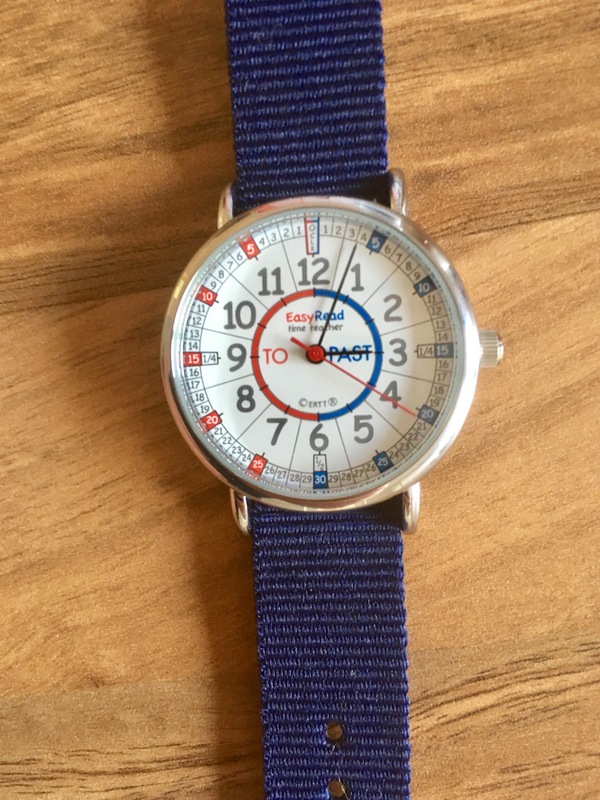 The watch is colour coded, like the wall clock, with the first half of the clock face having blue features to show its ‘past’ the hour and the second half red to show its ‘to’ to the hour. Keeping these festures the same as the wall clock really helped our child to learn to tell the time easier. The Teaching System Works– We’ve been using the three stage teaching system for over a month now and I can honestly say it works. It’s such an easy way to explain to children how to tell the time. They just have to read the number the big hand is pointing to, then say which half of the clock face it’s on ‘past’ or ‘to’ then which number the small hand is pointing to. For example 5 to 1: the big hand is pointing to 5 minutes, it is on the ‘to’ side so will be ‘5 to..’ and the small hand is pointing to the big 1 so it must be 5 to 1. Kids Like it- The EasyRead Time Teacher Watch looks and feels nice and therefore in our experience, kids are keen to wear it. Ultimately, this has to be one of the most important points- as children need to like the watch and wear it in order to learn to tell the time with it! The watch also comes in a range of different colours. Regular Opportunities to Practise Telling Time– Wearing the watch meant that we could practise telling the time wherever we were. We could do it at the shops, the library, on the way to the meet friends etc. Not only did this make it more fun but using it in real life situations provided a bigger incentive to be able to correctly tell the time. For example “We are meeting your friends at 10 o clock- what time is it now?” is a much more inviting way of learning to tell the time than just repeating “what time is it now?” at various intervals throughout the day. 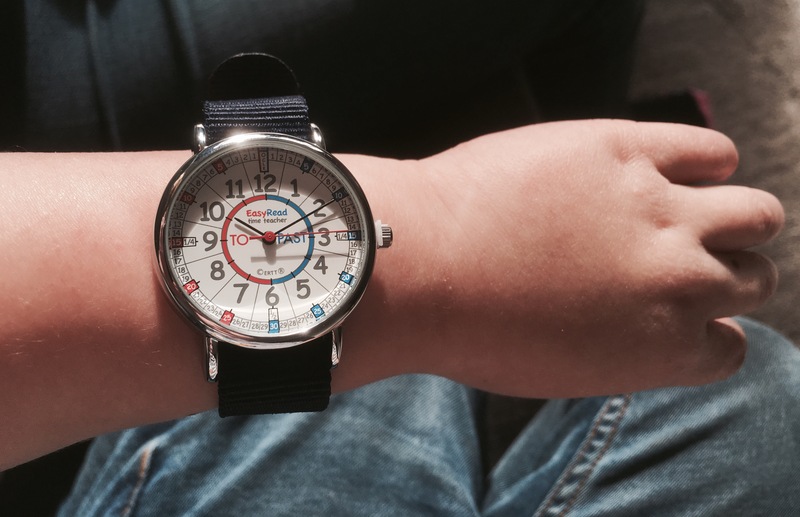 Practical– I was also impressed with the watch from a practical and parental point of view. 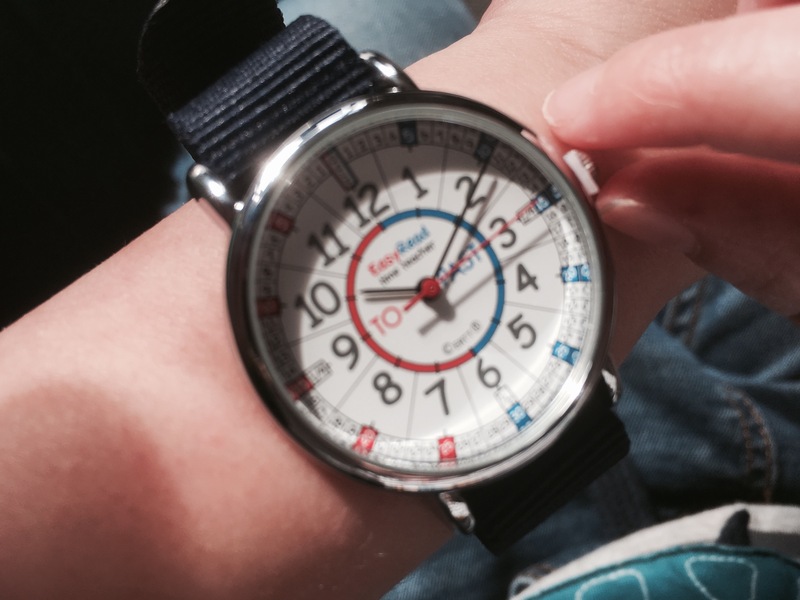 It’s comfortable, fits a young child’s wrist well and can be adjusted to fit a ‘medium adult’. I was initially concerned that the clock face would have to be quite large in order to fit everything on it but that’s not the case, it manages the balance perfectly: it’s a good size to be able to read the numbers but it’s not be too big for the wrist. Other practical features include its stainless steel, non allergenic plating back-reducing the chances of skin irritation. It comes complete with a battery and is water resistant to splashes. *Please note we were sent a sample for review and this post is sponsored. However, as always, all thoughts and opinions are our own.